Evan Pugh was born on the 15th February 1896 (birth cert) at Pandy Square, Abergynolwyn to Rees Pugh and Margaret (Jenkins) Pugh. He worked in the slate quarry there when he left school at the age of 12. Then spent the WWI years in the coal mines of South Wales, followed by a spell as a labourer around Bangor after his marriage. He became an insurance agent and worked his way up to office manager, eventually retiring while living at Stoke on Trent. Evan had a nickname among his brothers as 'the Tycoon'. Without doubt Evan was an impressive character, noted for his commercial dealings. However virually anyone who knew him remembers Evan as a strong disciplinarian with a terrible temper. A typical comment was from a nephew who stayed with Evan and family in Wigan for what he remembered to be a very 'subdued' weekend (actually, he said it was hard going). Sunday lunch was served and Evan discussed a topic, only to have his wife interject to say something to one of the children. Immediately Evan rapped the table with his knuckles and said something along the lines of 'I was talking, so therefore you should keep quiet'. The fact that my father can remember this spontaneously some 70 years later suggests that this was a more forceful gesture. In summing up, dad said that Evan was a hard man. (my dad is not exactly a pussycat either). His children and grandchildren have had similar stories to tell. The 1901 census records shows his brothers Ivor (1889), Hugh Silvannus (1890), Rees ((1892), Richard James (1900) and sisters Jane (1894) and Elizabeth (1898). Later records show that he also had further siblings in Morris Edwin (1901), Thomas Jenkins (1903), Idwal (1905), Margaret Winifred (1908), and Sarah Ellen (1909). 1899 School admission of Evan Pugh, aged 3y 1m on 29 Apr 1899. Living at Pandy Square. 1909 on 23 Nov 1909 Evan, 12y 4m, leaves school with labour certificate to start work. He could not get work at the local slate quarry Bryneglwys Slate Mine because it ceased production in December 1909. Due to the quarrying of all the best rock and the lack of capital investment for many years, it had gone into a decline. On 17th December 1909 the men were told that the quarry was to close the next day. The remaining stocks were sent down the railway, and the machinery began to be dismantled. It was closed in 1910 and 1911, and restarted production in 1912, employing 90 to 100 men in each of the years 1912, 1913, 1914, 1915. But by 1918 there were only 45 employed there, although numbers did pick up after the war. So Evan Pugh started work delivering milk, then helped as a plasterer before joining his father as a slate quarryman in the Bryneglwys slate mine. It is said that he learnt English by reading the bible in English. He knew the bible off by heart in Welsh, so worked out what the English meant. He must have met his future wife, Elizabeth Ann Evans in 1914 (assuming that he was the father of her daughter Jane). On leaving school Elizabeth Evans worked as a kitchen maid to a Rev Roberts at the vicarage at Tal y Llyn. 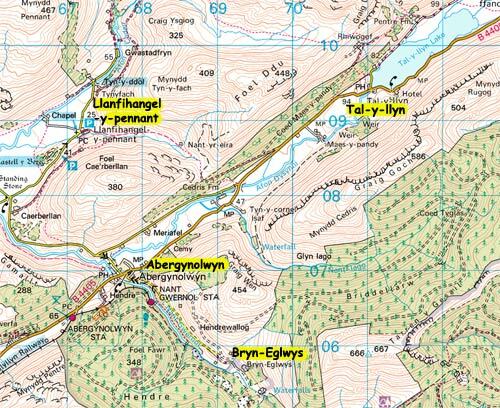 which is the next village to Abergynolwyn where Evan Pugh lived. I presume that is where the two of them met. At some point Emrys Pugh understands that Evan Pugh (his father) refused to let Cissie to go to work for Mr Roberts. I am not sure if that was after they married, or when she fell pregnant and he didn't want her going back there and shaming him in a neighbourhood near where his parents still lived. However the long and short of it was that a child was born. My mother Jane was born 26th June 1915, originally called Jane Pugh Evans (with no father on the birth certificate) until she became Jane Pugh, when her parents re-registered her in 1935. Jane was therefore conceived in autumn 1914. 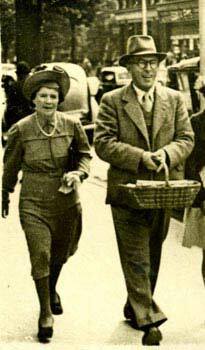 Evan went off to South Wales, eventually marrying Cissie Ann Evans in 1919. It is impossible to know if he knew that he was the father of a child during the period 1915 to 1919 or not. Given that many people in the forces married, there was in principle nothing to stop him marrying. Was he dragging his feet, or did he genuinely not know? Or was there another reason? 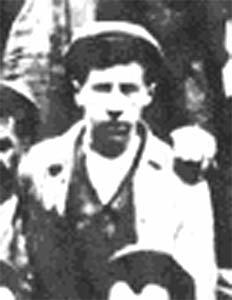 Evan Pugh didn't join the army but worked as a coal miner at Treorchy in South Wales during World War I. Quarrymen were drafted into the coal mines of South Wales, and that was what happened to Evan and his brothers. Britain introduced conscription 2nd February, 1916, under DORA (Defence of the Realm Act). By then over a fifth of all miners had left coal-mining and enlisted in the army, and Britain needed more coal. Coal mining became a "reserved occupation" and miners were, as whole, not allowed to join the army, although the government did enforce a certain amount of weeding out of miners for transfer to the army right up to the end of the war. With the outbreak of the First World War in 1914, coal mines were taken under governmental control. Relatively a good period for miners as government control resulted in increased safety standards, and higher wages with the same wage rate in all areas. Miners were mainly happy that the government ran the mines. 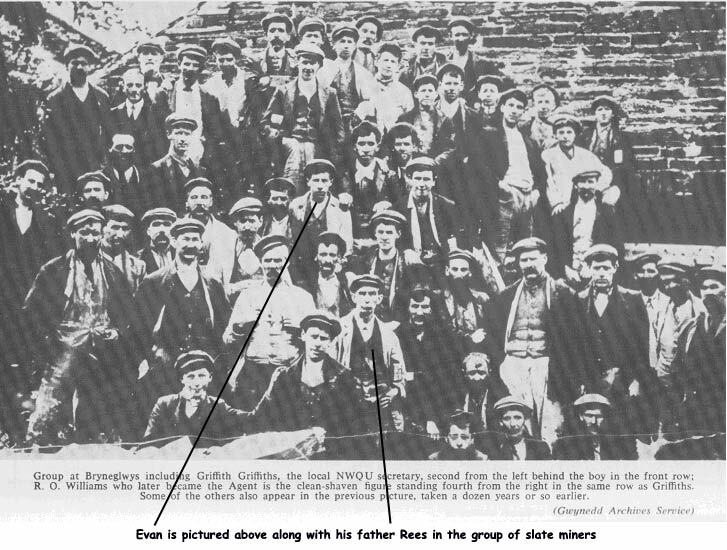 Soon after the end of the 1914-1918 war, Rees Pugh (Evan's father) and family moved to Blaenau Ffestiniog, presumably to work in the local slate quarry there or more likely given his age (Rees Pugh was born 1861) for his family's benefit. Emrys Pugh states that Evan Pugh never worked at the Blaenau Ffestiniog quarry. 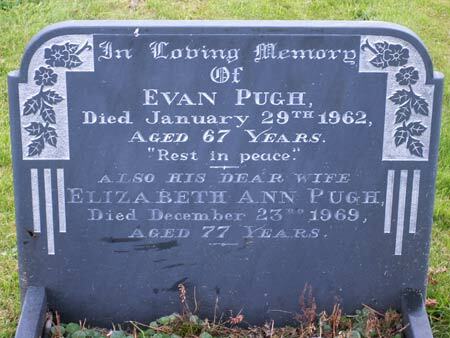 Evan Pugh and Elizabeth Ann Evans were married at Glanadda Parish Church, Bangor in 1919. At that time Evan was given on his marriage certificate as being employed as a miner and was living at 13 New Chapel Street, Treorchy in the Rhonda valley of South Wales. His marriage in Bangor to Elizabeth Ann Evans was by licence, rather than the normal banns, hence avoiding the need for banns to be read out in his home village of Abergynolwyn. New Chapel Street is not the most sought after address in Treorchy. 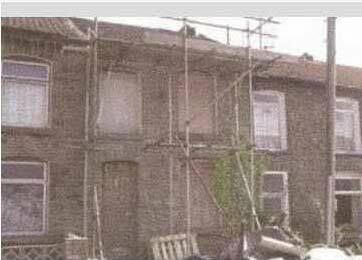 It comprises small cheap terraced houses. My feeling is that marrying by license was to avoid scandal as Jane Pugh, their first child, was 4 years old at the time of the marriage. Emrys believed that there was a plaque to Evan's mother in the church at Abergynolwyn. However it is no longer there, the whole church being devoid of plaques today. If Evan Pugh's mother was an influential figure in the church and Sunday school, then a scandal with his marriage would not have gone down well. Evan and Sissy Pugh lived from the time of their marriage in 1919 at 221 Caernarfon Road, Bangor until just after the birth of Emrys in 1928. They were living at 221 Caernarfon Road at the time of the birth's of their children Margaret Elizabeth (Peggy) in 1922 and Rhianon in 1924. Cissie Evans, Evan Pugh's wife had been living at this address in 1915 before her marriage to Evan Pugh, when Jane Evans (later Jane Pugh) was born, so it is probable that the house either belonged to, or was rented by, the Evans family. Evan Pugh is listed as a "General Labourer" on the birth certificates for his children in 1922 and 1924. And he was such till he joined Britannic Insurance. After leaving the mine he went to work at Dolgarrog Aluminium near to Conwy, working here until he joined Britannic Assurance.During the week Evan Pugh lived in digs in Dolgarrog but at the weekend he would walk home to Bangor over the Snowdonia mountain range. 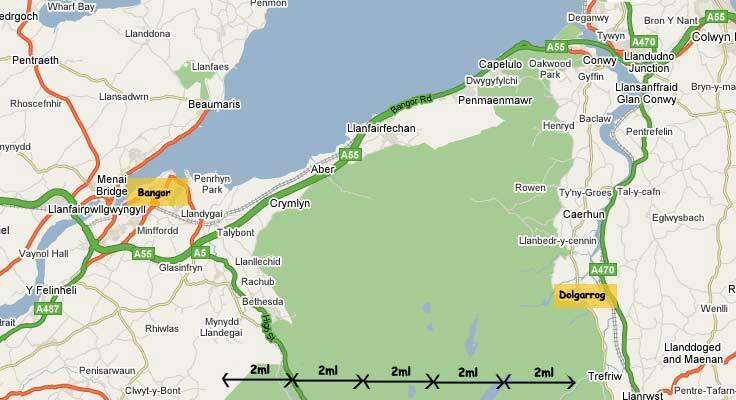 The only way of doing this and avoiding mountain climbs, would be to increase the distance of 12 miles as the crow flies from Bangor to Dolgarrog, to around 17 miles by going via Conwy. This has to be quicker than taking the direct route. but nevertheless would have taken probably 5 to 6 hours. To have done this every week in winter as well as in summer would have been a Herculean feat. A notable event during this period was the Dolgarrog Dam failure on 2nd November 1925 which killed 16 people at 9.15 on that Monday night. It is probable that Evan Pugh was working there then. A dam had been built above the village and the waters from the dam were allowed under a controlled flow, down to a second dam built in 1922 at Llyn Coedty. From there, a single steel pipeline delivered the water to the power station, on the same site as the aluminium works.This system worked well until the 2nd November 1925. In the previous days heavy rain had fallen, leaving fast running deep rivers feeding into the Cwm Eigiau reservoir. The top dam overflowed into the bottom dam. This dam was overtopped, washing away the embankment, and the core collapsed. There was an almost instant release of 70 million gallons of water. A wall of water, mud, rock and concrete hit the village of Dolgarrog at 9.15pm . Fortunately many of the villagers were attending a film show at the village Assembly Hall out of the path of the flood, and 200 workers were working late in the nearby aluminium factory, otherwise more lives would have been lost. As it was, ten adults and six children were killed and many houses were destroyed. At the subsequent inquest, the deputy coroner said that "as Dolgarrog had a floating population, it was impossible to estimate the extent of the catastrophe in regard to human life". 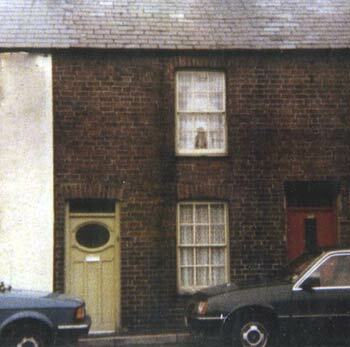 The family moved to 342 Caernarfon Road shortly after Emrys's birth in 1928. It was during one of his visits home that the insurance man came to call. Evan did not recognise the agent and asked if he was new. The man replied that he was the manager of the Bangor office and that his agent had left and he had a vacancy. Evan took the job, his “debit” covered Bangor and the Isle of Anglesey, which he covered on a bike. Emrys Pugh believes that his father Evan Pugh became an Insurance Agent around 1930. He was later promoted to assistant manager at the Aberystwyth branch around the time of his parents death in 1932. He and his family lived in Aberystwyth for around 18 months. There was further promotion to become the manager at Caernarfon in 1933, and when Elizabeth Ann's father Henry Evans died in September 1933, her address was Bryn Aber, South Rd, Caernarfon At the time of Mair’s birth in 1934 Evan was employed as an Insurance Office Manager with Britannic Assurance. The family were still living at Bryn Aber, South Road, Caernarfon when Mair was born. 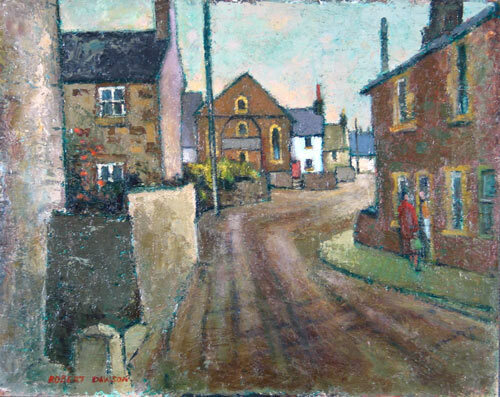 In 1937 Evan’s work took him and the family away from Wales to 217 Orrell Road, Orrell near Wigan in North West England. The then 3 year old Mair left Wales and therefore needed to become fluent in a new language, English. Evan Pugh purchased a house in Rhiwlas when they lived in Wigan towards the start of the World War II. He was fearful that the children would be evacuated and he wanted to be able to keep them together, hence the bolt hole in Rhiwlas. This was used for subsequent family holidays. 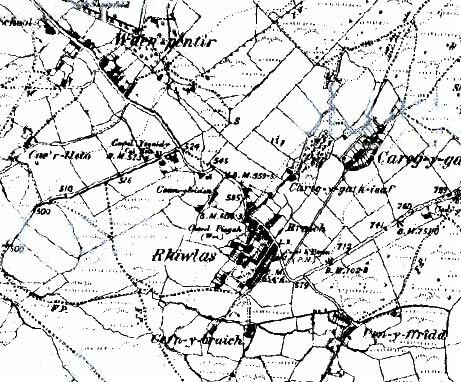 Rhiwlas was where his wife had been brought up for a number of years. Soon they were on the move again, this time to Stoke-on-Trent to 50 Bailey Road, Fenton (Heron Cross). 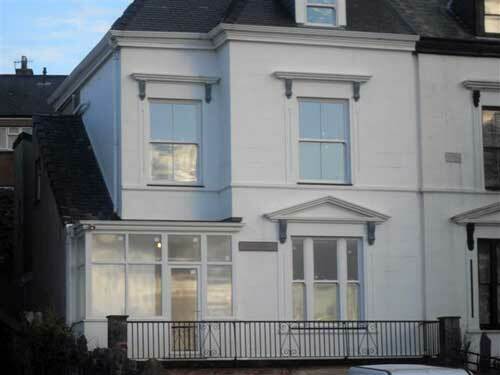 They were living at this address when their first grandchild David Grant was born on 4th September 1945. Jane and Alan Grant were living at that address on the birth certificate. After living here for a few years they moved for the last time to Brangwyn 57 Greatbach Avenue, Penkhull, Stoke-on-Trent. The Pugh family moved here at the end of World War II, and owned the house until Elizabeth Ann Pugh died in 1969. Chris Sutton remembers it as a child as "the big house in Penkhull with the snooker table and the clocks"
Mair's husband worked in the same Britannic Assurance office in Stoke. Evan was a man of mixed character. Outside of the home he was seen as a gentleman but inside the home his all too familiar temper was literally felt by his family. Died on 31 January 1962 after suffering with painful spinal cancer, Evan passed away and was buried in the small graveyard at Pentir, near to Rhiwlas in North Wales.